Home > Dollhouse Bathroom Accessories > Towel Set - Mr. & Mrs.
Towel Set - Mr. & Mrs. 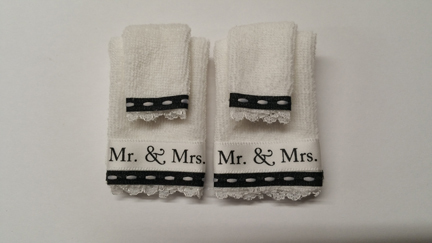 Description & Info for Towel Set - Mr. & Mrs. 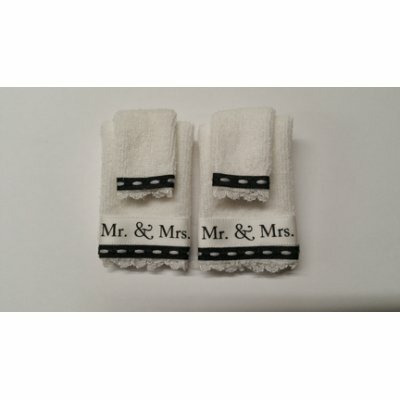 This super cute MR & MRS black and white towel set is a nice gift for a friend who's getting married and loves dollhouses. The 1:12 scale miniature bathroom towel set are a terry cloth, adorned with decorations. These pre-folded (glued edges) measure about 2 inches long by about 1.27 inches wide. 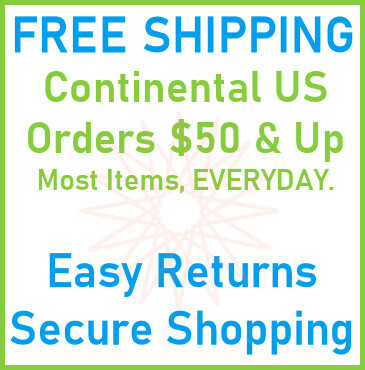 2 bath towels and 2 miniature hand towels are included. Date Added: 10/04/2018 by Iona K.
This Towel Set - Mr. & Mrs. is supplied by Handcrafted Miniatures By Barb, which generally ships within 1 business day(s) of you placing your order .